The American Health Quality Association (AHQA) is dedicated to promoting and facilitating fundamental change that improves the quality of health care in the United States. AHQA provides advocacy and collaboration for the the national network of quality improvement organizations under the Medicare program. AHQA serves as a professional resource and partner on project with the Centers for Medicare & Medicaid Services (CMS) at the Department of Health and Human Services. The existing website needed modernization to align with the cutting edge health care industry, while maintaining a professional tone. AHQA also required a website that was easier to maintain yet feature rich. 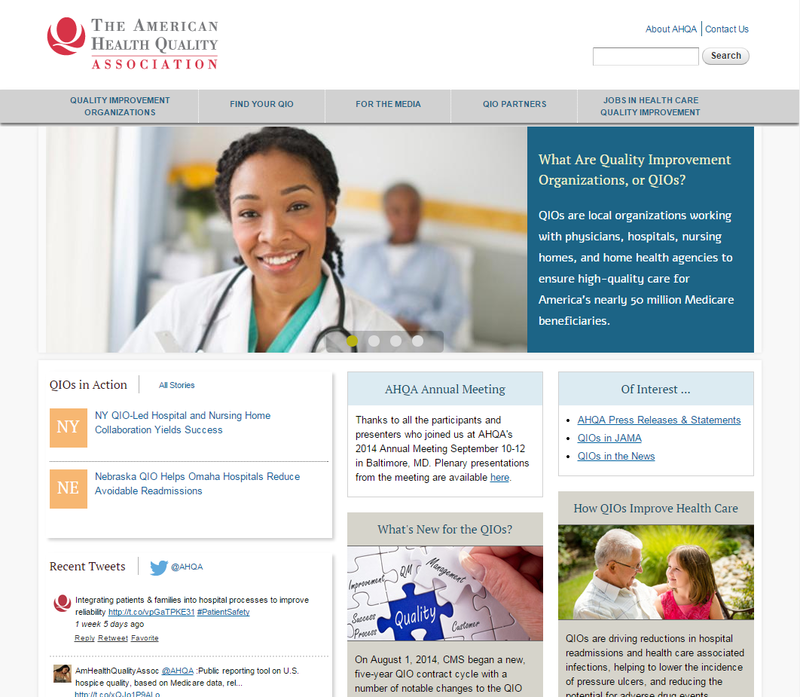 Interviews with AHQA members helped to clarify the disconnects between the existing website and AHQA mission. Members identified content that they would find valuable and workflows that would make it easier to find content. We redesigned the architecture to simplify the website navigation and gave the site a clean graphical interface. Content was designed to promote the successes of the membership, the goals of the organization, and the educational aspects of AHQA. A Twitter feed keeps the organization connected with the industry. A central element to the site is a mapping application that, at a state level, guides the reader to data about the quality improvement organization that serves that state. Interestingly, the structure of the state membership just underwent a paradigm shift, rendering the mapping inaccurate. Since we built it on Drupal, it was simple for AHQA to substitute other content for the map while SoH redesigns the underlying data structures. Thanks to Drupal we can make this major change in architecture with minimal disruption to the website. The mapping application will be back online shortly. The website also takes advantage of a workflow management system, allowing for the revision, review and publishing of content by multiple staff. A current version of the content can remain live while revisions are written and waiting for approval. The next phase of the website will bring a custom association management system that will allow for discussion board collaboration and sharing of vital documents.